A landmark in the history of cinema, telling the story of newspaper magnate Charles Foster Kane in a series of flashbacks. Starring Orson Welles. Frequently voted one of the best films ever made, Orson Welles's masterpiece tells the story of newspaper magnate Charles Foster Kane in a series of flashbacks. A reporter is intrigued by the dying Kane's last word - rosebud - and sets out to find a new angle on the life of one of the most powerful men in America. Nine Oscar nominations resulted in only one award for the outspoken Welles - Best Screenplay. Hear archive interviews with Orson Welles about one of the greatest films of all time. What's so good about Citizen Kane? It has topped BBC Culture’s list of the greatest American films – and many other polls before. But what’s so good about Citizen Kane? Citizen Kane's follow-up: The greatest story never made? In honour of Orson Welles’ death 30 years ago, his friend film-maker Henry Jaglom tells the colourful story of their attempt to make a ‘bookend’ to the greatest American film. 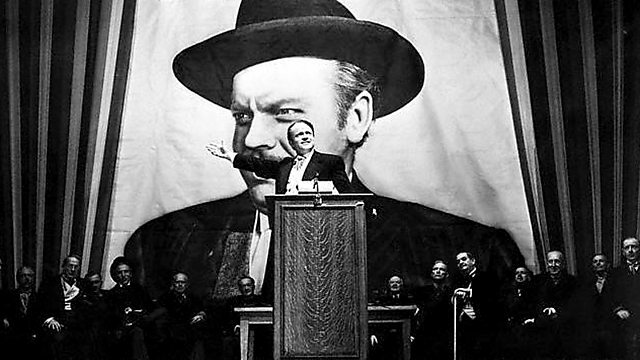 Citizen Kane: More than a great movie?